The monumentality of Dia:Beacon is astonishing. It’s the Vatican of minimalism, the church in which those who worship saints like Sandback, Ryman, Serra, Beuys, Lewitt and Smithson congregate. The immensity feels opulent, the art sleek and self-contained and notably unconcerned with the notions of social conscience that have of late asserted themselves in the post-modernist landscape. Here’s a note that accompanies a Sol Lewitt, a squiggly line on a wall: “A not straight line is drawn from a point halfway between the center of the wall and the midpoint of the right side to a point halfway between the midpoint of the right side and the lower right corner to a point halfway between a point halfway between the midpoint of the top side and the upper right corner to a point halfway between the midpoint of the right side and the upper right corner.” The object of Fred Sandback’s string sculpture is described thusly: “To assert a certain space and volume in its full materiality without occupying it and obscuring it.” This temple of formalism is a little like the Large Hadron Collider—a huge space is required to unleash small particles, the esthetic equivalent of the elementary building blocks of matter. The scale of Dia:Beacon is also reminiscent of Versailles, and like Versailles it venerates order and an aristocratic view of art that has all but passed from our world. 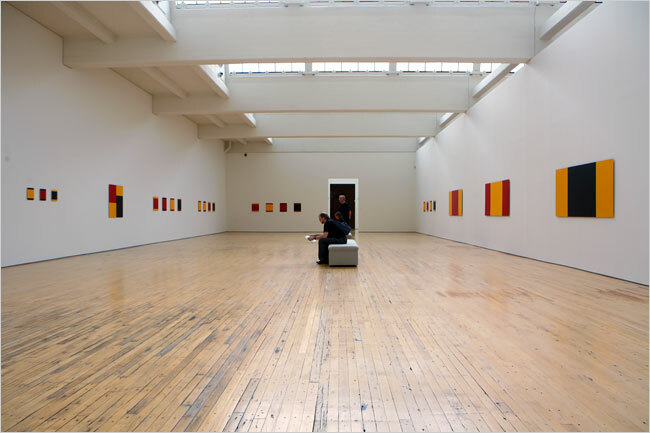 I can't say I was a fan of formalism in its heyday, but Dia:Beacon is well worth a visit. I walked away from there with a much greater appreciation and understanding of the work represented. Not all art has to have a 'social conscience'. Some art can be about process, and how we see and experience time and space. I give the occasional tour there and travel from Manhattan to do so because it's my favorite museum in the entire tri-state area. "This temple of formalism is a little like the Large Hadron Collider—a huge space is required to unleash small particles, the esthetic equivalent of the elementary building blocks of matter."